It is my hope that you will take a few moments to review both. 3.) Our Founder, De Facto El Presidente? 23 three spots are on the map. I'm willing to make more if they get claimed quickly. I get spots 2 and 3. 1 is reserved for Panageadom if he still wants it. 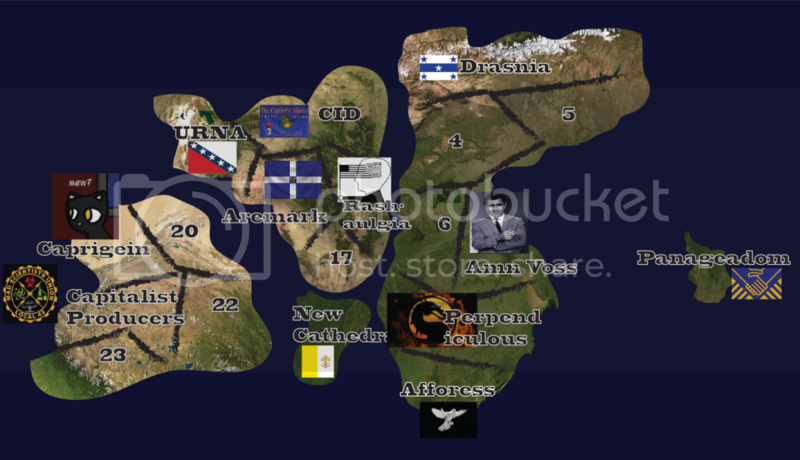 This map will be used for any RP's that will take place here on the forums. Issue #2, June 22 2012. 2. )Endorsement Caps, A Capitalist Solution? The date is June 22nd. 11:30 am on June 22nd, 2012. The Capitalist Paradise's regional message board contains dozens of messages. On closer examination, you see that each of these are suppressed by the delegate. The World Assembly factbook lists the nations with the largest pizza industry. Only 9 nations are listed. Half of the nations have a skull and bones flag. The each have the same motto. "Death to the Capitalist Paradise". I've written a simple nation greeting bot that sends telegrams when nations enter the Capitalist Paradise. You can see whether it is online or offline from the regional summary tab. It shouldn't ever go offline, but in the event it does, it's easy to tell.